Few things are more nightmarish and stressful than having a disaster strike your home. Fires, flooding, storms, and hurricanes can all cause thousands of dollars’ worth of damage, making a catastrophic situation even more difficult to bear. Before you lose hope and declare your home a loss, call LMS Restoration. We sympathize with the enormous weight you must be under and are here to help you restore your home to its former glory. We are the largest Native American-owned restoration company in the United States and made the INC 500 list in 2002 as one of the fastest growing privately-owned companies in the country. At LMS Restoration, we strongly commit to earning our client’s loyalty and trust by providing the very best in customer service, the finest quality workmanship, and creative solutions to all problems big or small. 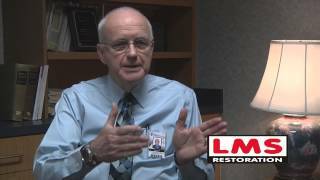 Established in 1997, LMS Restoration is led by CEO Don Preston, a Certified Restorer, one of only eight in the state of Texas. Proudly Native American-owned, we are pre-qualified for ‘Indian Preference’ status and remain at the cutting edge of restoration processes and disaster response. Aside from our inclusion to the INC 500 list, LMS Restoration has been featured in such notable television shows as Restoration Renegades and Extreme Makeover Home Edition as the crew of choice for jobs located in Sulphur Springs, TX and its surrounding area. In particular, for the Extreme Makeover Home Edition episode in 2012 that featured Sgt. Shilo Harris and his family, LMS Restoration took part in a 5-day build in Wilson County near San Antonio that removed the Harris’ existing structure before rebuilding the home from the ground up. LMS Restoration donated equipment which included a trailer-mounted dehumidifier and generator, as well as 24-hour monitoring and labor to expedite the building of the new home, which happened over January 15-20, 2012. In essence, LMS Restoration, along with members of the Extreme Makeover Home Edition team, were able to build a brand-new home for this deserving army veteran and his family within 5 days. Visit our website or call us at 903-229-4846 for a free estimate. Feel free to inquire about other services that may not be listed here and that may help make your home or office a more welcoming space for your family or employees. In Sulphur Springs, TX and the surrounding area, there’s only one name you can trust when it comes to disaster restoration. LMS Restoration offers lasting value with consistent, reliable service that’s available and on-call 24 hours a day, 7 days a week. Rest assured, our team of professional restorers will be on their way as soon as possible to restore your property to its pre-disaster condition. This way, you can get your household or office back in order in the shortest time. Disaster doesn’t warn you in advance, so our team is always prepared to take your call. Visit our Contact Us page for more options on how to get in touch with our team, or give us a call at 903-229-4846. Garcia hired LMS Restoration to do professional Air Duct Cleaning in Air Duct Cleaning, TX. Garcia said the customer service was great. In September 2010, 65,000 gallons of water flooded into the Hopkins County Memorial Hospital in Sulphur Springs, Texas. The hospital was completely unprepared for this massive plumbing disaster. LMS was there to help!